Replacement: None. Pricing increases have forced us to discontinue carrying these. This page is for reference only. LaunchPad is an easy-to-use development tool from Texas Instruments intended for both beginners and experienced developers. 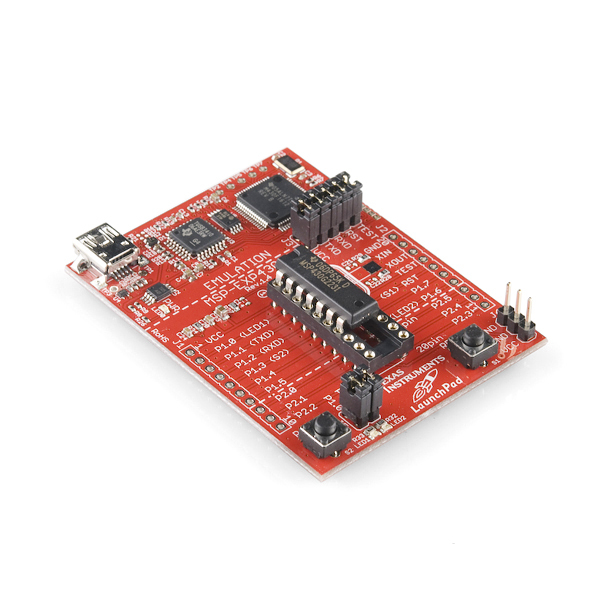 The LaunchPad offers everything you need to get started with your microcontroller-based projects in a small package. The LaunchPad development tool is a part of what TI calls "the Value Line series," meaning the devices are inexpensive and accessible even for hobbyists. 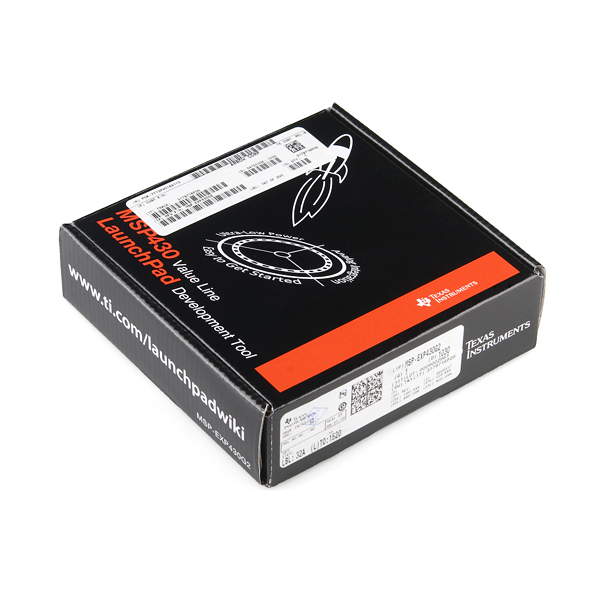 The integrated DIP target socket allows all 14 and 20-pin MSP430 Value Line devices to be dropped into the LaunchPad board for easy programming, debugging, and monitoring. You even get unrestricted and downloadable software development environments for writing and debugging software. The LaunchPad can be used to create interactive solutions thanks to its integrated buttons, LEDs, and extra input/output pins for easy integration of external devices. Note: We are currently shipping version 1.4. Includes all of the hardware and software needed to get started. Pre-programmed devices and code examples help you get up and running quickly! Includes a development board, 2 programmable MSP430 microcontrollers, mini-USB cable, PCB connectors for expandability, external crystal for increased clock accuracy, and unrestricted software integrated development environments (IDEs) – everything you need to get started today. 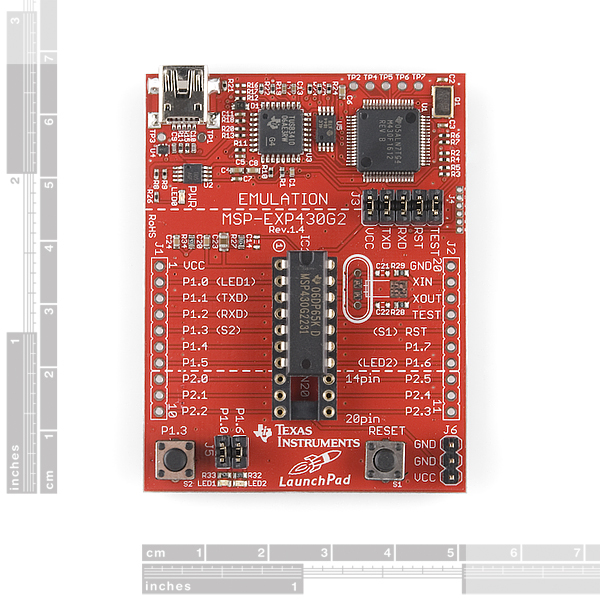 A simple introduction to the MSP430 microcontroller family. As application requirements change, programs developed on the LaunchPad can be migrated to higher end MSP430 devices. I ordered mine from TI on the 5th (two days ago) and it was here from Singapore the next day (yesterday). All for $4.30. I would think that overnight overseas shipping would cost more than that. As others have said, TI's estore was a bit of a pain though. TI has a manufacturing plant in Singapore (I think, if not very close) so I doubt they shipped it to the US just to ship it back to Singapore. If you're familiar with the Wiring/Arduino language, there's now a port that generates MSP430 code: Energia. Not too many of the libraries have been ported, but it does work. It's also supported by TI. Are you planning on stocking a later version? And just as valuable as a TI LaunchPad + a USB cable. I already got the LaunchPad from SF a week ago, but now I want more chips to use with it. so with the pin conversion i could plug a usb host shield like this http://www.sparkfun.com/products/9947 or will that not work as in saying if the pins connect to the right pins will it work? Buy direct from TI for $4.30 and no shipping. Just got a few the other day. Will the capacitive sense booster board (430BOOST-SENSE1) be making its way to SparkFun too? How long is the USB cable? I assume I can use the cable with the Pocket AVR Programmer, right? 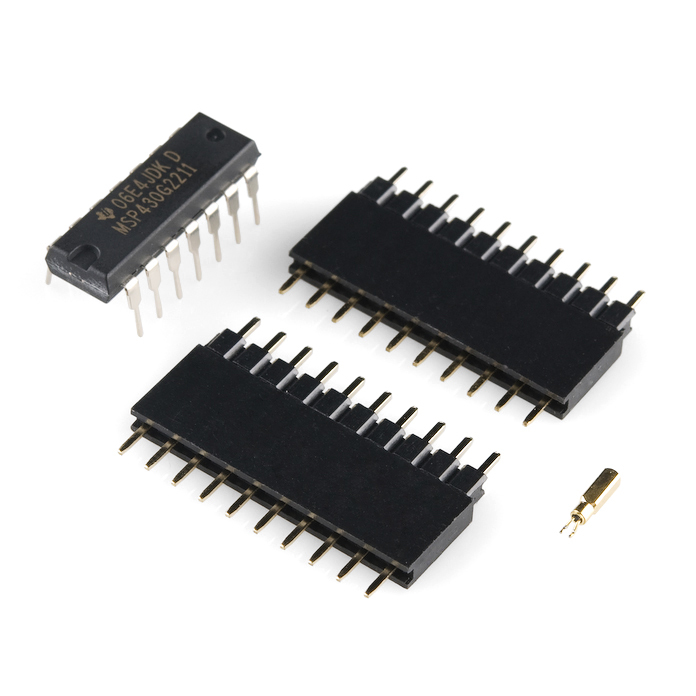 You can find MSP430 chips from Digikey, Newark, Mouser, Etc... Or you can ask TI nicely for some samples. Late, I know, but for future users try energia (arduino like IDE). are these pin compatible with the arduno uno pins like can i use some of the sheilds with or without modifications? Hi disabelle, This isn't pin compatible with the Arduino. However I'm working on a Arduino To MSP430 Launchpad conversion add-on, I'll keep you posted. I'm sure there is a good reason for this being $6 when it's intended sale price was "$4.30". Not saying it's not worth it though, this kit rocks for what it is, and what it is is pretty impressive. As mentioned above, it comes with quite a bit and it's worth it to get one just to play with it. The datasheets are great and not as cryptic as some of the avr sheets. I got this the second they came back in stock, the 2nd I think it was. TI's documentation is a little sparse, so it's taking me a little longer than usual to get going with this. Overall, it just can't be beat for the price. Plus, it's finally forcing me to move up from Arduino. Any idea when you might have them back in Stock? I have had two on back order for awhile now. Stock on these has been very unpredictable. They have been very difficult to keep in stock. We have no idea when we will get them. The forum has quite a few project to get started. I must be lost... Could someone explain to me why this is less than 6 dollars!? So many features for so less... This product virtually beats every low and medium scale microcontroller. Will you stock chips soon? Scratch medium. Looks like i jumped the gun and thought, "Hey, 100Kb of program memory and tons of peripherals, what a great deal!" until i found out that this is the value series. 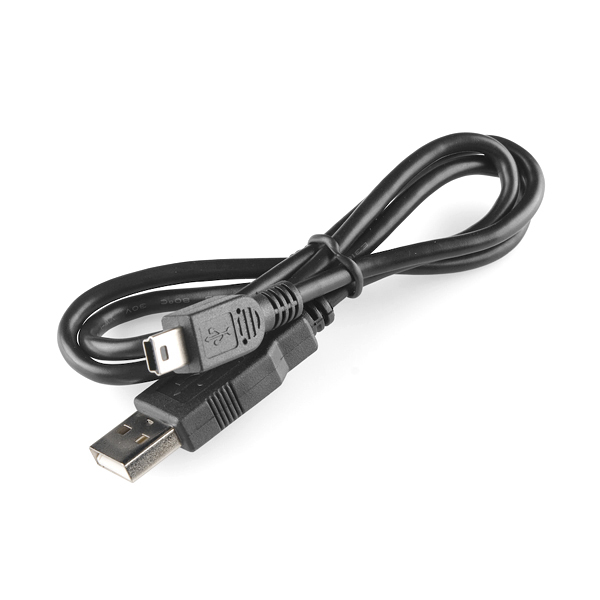 Still a awesome deal for programmer, 2 micros and a usb cable. Wow, what a cheap Arduiono alternative! It may not be as easy, but the value line chips are packed with features if you're willing to learn C or assembly. I bought two from digi-key for 4.30 a few weeks back. Mouser had some on order for the same price. I ordered two on the 4th from the TI e-store, and they shipped yesterday. Don't know what's up with that. However, I don't expect the evalbot that was in the same order to come in anytime soon. We ordered them awhile ago too. But, we are gone now. Sigh. I originally requested one from TI in July also, got sick of waiting last week and ordered one from digikey instead which arrived the next day. Low and behold, TI delivered theirs the following week. Any plans to sell the Evalbot? I'd much rather use your e-store than TI's.